Welcome to The Candy Factory……. A sweet place to be! THE CANDY FACTORY IS A SWEET PLACE TO BE! 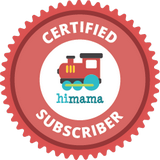 "My husband and I absolutely love the himama app. The Candy Factory Daycare workers update the app daily with great pictures and videos of our son playing with toys, learning new things, eating lunch, and happily playing with other kids. It’s the best feeling to see the notification while we're at work that says "Look what I’m doing today!” with pictures and captions. It’s the best!" "Love the app, it's awesome seeing a picture or two a during the day of what Beatrice is up to. Puts a smile on my face as a dad who for 18 months was always getting photos from my wife during the day of what my kid was up to. I really do appreciate the photo updates and notes on how her day is going, plus it is an easy way to track when we need to bring in diapers and supplies as well. Can't thank you enough."